Navajo Nation Council Speaker Pro Tem LoRenzo Bates and Council Delegate Leonard Tsosie speak with Frannie Atcitty, the former running mate of disqualified Navajo Nation presidential candidate Chris Deschene, during a recess of the Navajo Nation Supreme Court’s special hearing on a last minute request by President Ben Shelly and the Council for the high court to vacate Shelly’s petition to allow him to remain as president and the Council’s petition for the disqualification of Chief Justice Herb Yazzie. 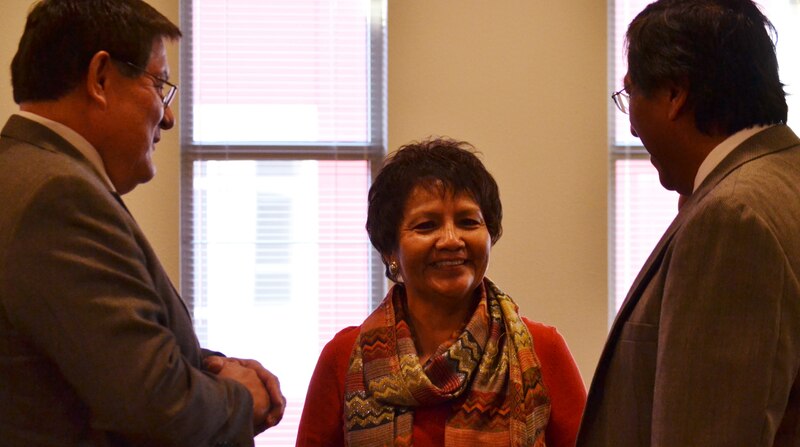 The special hearing was held at the Navajo Nation Department of Transportation in Tse Bonito, N.M., on Jan. 10, 2015. Photo by Marley Shebala. If reusing photo, please provide proper credit. After a deal was struck between Navajo Nation President Ben Shelly and the Navajo Nation Council to let him remain in office until a new president is elected and inaugurated, Shelly wasted no time in signing off on two pieces of controversial legislation approved by the Navajo Nation Council on Dec. 30, 2015. Today, Jan. 10, 2015, was the last day for Shelly to either sign, veto or take no action on Council legislation to nullify the 2014 Navajo Nation Primary Election for the presidential race and hold a June 2015 Primary Election and August 2015 General Election for the presidency and to pardon the Navajo Board of Election Supervisors. The agreement between Shelly and the Council was revealed today, Jan. 10, 2015, just minutes before the Navajo Nation Supreme Court convened a special hearing to hear a petition from Shelly that would recognize that Navajo law supported his claim that he should remain in office until a new president is elected and inaugurated and not the Council’s claim that Shelly’s term ended at noon on Jan. 13, 2015, which is when the new Council would be inaugurated. The Council’s claim also involved their citation of Navajo law that allowed them to appoint an interim president from among their ranks. 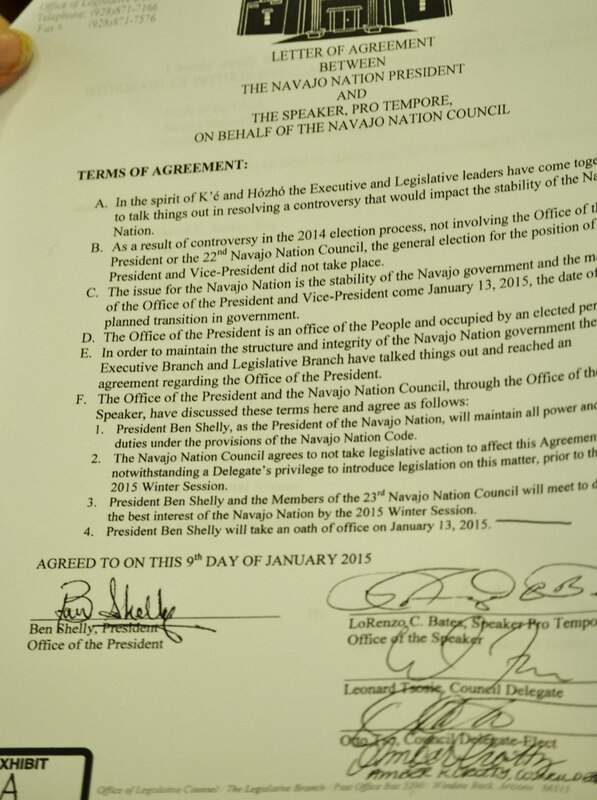 The deal between Navajo Nation President Ben Shelly and the Navajo Nation Council that was signed on Jan. 9, 2015. Photo b Marley Shebala. If reusing photo, please provide proper credit. Navajo Nation Council Speaker Pro Tem LoRenzo Bates, Council Delegate Leonard Tsosie and Delegates-Elect Otto Tso and Amber K, Crotty signed the deal for the Council, which was stuck with Shelly on Jan. 9, 2015. Tsosie was the sponsor of CD-80-14 and CD-81-14. The Supreme Court’s most recent order was the granting of a request by the Navajo Election Office for a second 60-day deadline to hold the special presidential election between former Navajo Nation President Joe Shirley Jr. and Navajo Nation Council Delegate Russell Begaye. The first 60-day extension ended on Dec. 23, 2014. The Supreme Court order the election office to hold the special presidential election before the end of January 2015. This entry was posted in News Articles, Professional Journal and tagged Navajo, Navajo Nation, Navajo Nation Council, Navajo Nation Supreme Court, President Ben Shelly by Marley Shebala. Bookmark the permalink.